“Lifetime Polymer” finish. The 1/4″ thick polymer coating is applied over the maple playing field, creating a maintenance free surface. Designs By H. J. Nick and Art Factory. Com LLC a handmade in America custom furniture manufacturer based in Scottsdale Arizona has been designing and building some of the worlds finest furniture for some of the world’s finest interior designers with ordinary clients as well as most prominent and successful Persons,C.E.O.’s,leaders,royalty and celebrities for the last 105+ years. Most of our clients want a furnishing that has a BIG WOW factor and elegance. All want investment value and furnishings that makes a proper statement reflecting their personality or the ambiance of the environment for which it is intended. Shuffleboard, more precisely deck shuffleboard, and also known as shuffle-board, shovelboard, shovel-board and shove-board is a sport in which players use broom-shaped paddles to push weighted pucks, sending them gliding down a narrow and elongated court, with the purpose of having them come to rest within a marked scoring area. As a more generic term, it refers to the family of shuffleboard-variant games as a whole. The game shed its crude beginnings when American cabinetmakers such as Hepplewhite and Duncan Phyfe turned out some of their finest inlaid cabinet work on shuffleboard game tables for the wealthy homes of New York City. By 1897, table shuffleboard rated as much space in the metropolitan newspapers in the New York City area as prizefighting and baseball. Highly publicized tournaments played by such colorful characters as “Big Ed” Morris, Dave Wiley, Alex Scott, Ed Gardland, and George Lavender drew hordes of fans. The fans faithfully followed the players to tournaments in New Jersey, in Newark, Paterson, Hoboken, Jersey City and Bloomfield, and even into Philadelphia. The fans included important figures of the business, theatrical, and political worlds. Shuffleboard made its way across the country. In 1904, Gentleman Jim Corbett, an avid player, had a tavern owner named Croll install a table in his Alameda, California, pub. “Doc” Croll, his son, claimed it was the first shuffleboard in that part of the country. 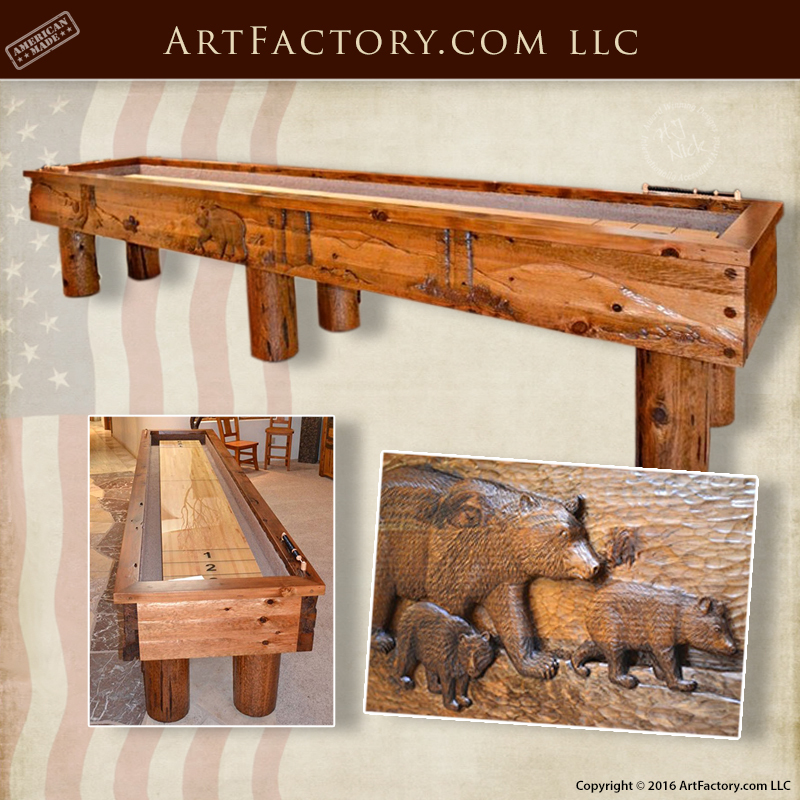 During World War II shuffleboard came into its own. The intrinsic appeal of the game â skill, diversity, competitiveness, availability to young and old, strong and disabled, the serious game, the fun game â offered the kind of release needed in those turbulent years. Fierce competition among major manufactures and suppliers, lack of uniform rules and organization, the inability to gain sponsorship of the sport, and general internal strife in all facets of shuffleboard, led to a demise of the game in the 1960s and 1970s. Some feared it was damaged beyond repair, but others invested their time, efforts and talents to breath life into the sport that they had loved. That dedication paid off, by the mid-1980s, shuffleboard experienced a reviva that has extended and strengthened in the 1990s.